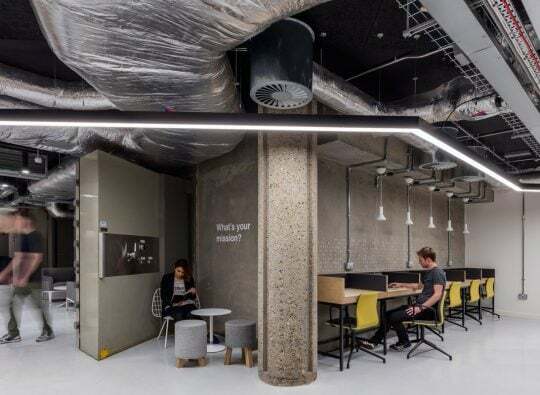 Our tech campus for RocketSpace and headquarters for dunnhumby have both been shortlisted for this year’s AJ Retrofit Awards in the ‘Offices Over 10000sqm’ category. LOM’s co-working accelerator campus in Angel, London, is designed specifically for high-growth tech start-up businesses. The fit-out and restoration at Regents House in Angel, north London, provides RocketSpace with flexible working spaces for up to 1,500. Set over three floors, including a former underground bank vault, LOM’s design strips back the 1980s building to its original shell revealing the structural core of blast proof reinforced concrete, intricate webs of coffered ceilings, and brickwork. For dunnhumby, a customer science company, LOM delivered a bespoke workplace set within a converted grade II former motor factory and showroom. The headquarters in Hammersmith brings dunnhumby’s 1,000 London based employees under one roof for the first time. The fit out retains the building’s original features and industrial heritage with an exposed structure and reclaimed bricks. The workspace contains a combination of individual, collaborative and client hosting spaces including a cafe, conference facilities and gym. The AJ Retrofit Awards, organised by The Architects’ Journal, recognise and celebrate design, engineering and construction excellence that prolongs and improves the life of the built environment. With £500 billion likely to be spent over the next three decades on upgrading existing housing, commercial and industrial buildings, retrofits will play a significant part of the future of the construction industry. The 2017 winners will be announced at an awards ceremony at The Brewery in London on 13 September.